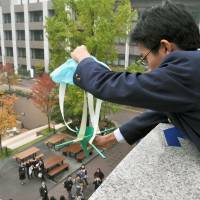 KOBE - A nonprofit group in Osaka has been organizing a contest for high school physics students since 2011 to see if they can build a device that can protect eggs dropped from 10 meters above the ground. 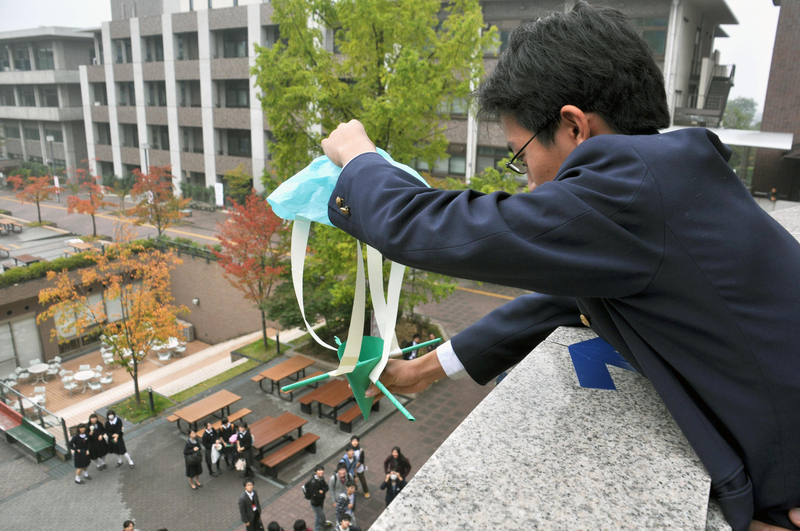 The event, dubbed Egg Drop Koshien, “can serve as a place where students acquire scientific knowledge but also generate innovative ideas on what materials they should use,” said Naoki Mishima, a 38-year-old representative of Monozukuri Kids Foundation. This year’s Kansai regional competition was held Nov. 3 on the Ritsumeikan University campus in Kyoto, bringing together 52 teams of three participants each. Each team was given the same materials to work with: scissors, glue and three kinds of paper of differing thicknesses and textures. The teams had 90 minutes to make a “protector” that can prevent a standard unboiled chicken’s egg from breaking when dropped from the third floor of the venue. The amount of paper and time spent, as well as the design of the protector, are evaluated, with each team judged by those present and watching online. “We made a contest in which students can experience what it is like in the manufacturing business, where development costs and production time need to be considered,” Mishima said. In the Kansai competition, only 17 of the 52 teams succeeded in building protectors that prevented the eggs from being broken when they hit the ground. “We designed the protector so that it would not lose balance due to the wind, but the egg ended up being broken,” said Miu Umehara, a 16-year-old in her second year at Kyoto Prefectural Fukuchiyama High School. But Daisuke Taniguchi, 18, said his team from Eiko Gakuen Senior High School in Kamakura, Kanagawa Prefecture, had it all under control. “The three of us brought our own ideas and improved the protector over and over,” he said. “We were all confident.” His team won both the Kanto and Kansai regional competitions this year. The egg drop has been a staple of science courses in the United States for decades. Mishima, a former employee at Mitsubishi Motors Corp., said he decided to start Egg Drop Koshien when he was part of the automaker’s motor sports racing team. He said he was tasked with “developing innovative ideas and widening the perspective of engineers” during his seven years with the team and always looked for ways to improve a vehicle, such as reducing its weight without weakening the body. Mishima realized that having a science education can help develop people who go on to play important roles in the manufacturing process, and that an egg drop could help promote science education in high school. Mishima said Egg Drop Koshien has won favorable reviews from teachers who accompany the students to the competitions. “The rules are clear and the event is easy to participate in,” he quoted one teacher as saying. “The competition offers students the chance to find out on their own how technology is used in a product,” said another. Mishima said he is planning to promote the egg drop contest in other parts of Japan.